Angus Sutherland Allen, M. C.
4th Bn. 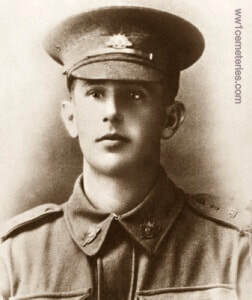 Australian Infantry, A. I. F.
21st July 1918, aged 22. Son of Victor F. and Euphemia Allen, of Manilla, New South Wales. Born Moruya, New South Wales. A bank clerk prior to enlistment, he embarked from Sydney aboard HMAT Euripides (A14) on 20 October 1914, as a Private with the service number 301. In 1918, with the rank of Lieutenant, he was awarded a Military Cross (MC) for brilliant services rendered to his battalion during strenuous fighting in front of Meteren and Merris, France. Promoted to Captain, he was wounded in action near Merris on 11 July 1918 and died of wounds on 21 July 1918 at the 1st Australian Casualty Clearing Station, Ebblinghem, France, aged 22. Angus Sutherland died as a result of machine gun fire which struck him in the stomach and wrist. 53rd Bn. Australian Infantry, A. I. F.
20th July 1916, aged 22. Son of Herbert James and Mary Aysom, of 24, Railway Avenue, Stanmore, Sydney, New South Wales. Born Melbourne, Victoria, Australia. His headstone bears the inscription; "Our Noble Son & Brother, Greater Love Hath No Man." 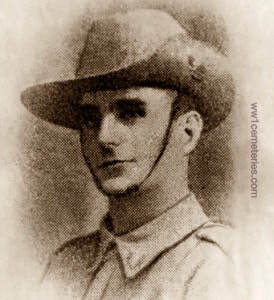 A carter prior to enlisting on 2 July 1915, he embarked for overseas with the 10th Reinforcements of the 1st Battalion from Sydney on 8 October 1915 aboard HMAT Warilda. 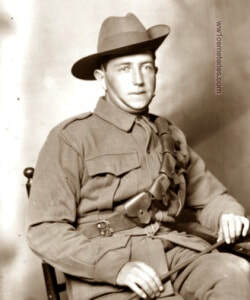 Following further training in Egypt, he transferred to the 53rd Battalion and joined the battalion in the field in France where he was wounded in action at Fromelles. Pte Aysom died of his wounds on 20 July 1916. 14th March 1915, aged 32. Husband of Julia F. Breese, of Garrison-on-Hudson, New York, U.S.A.
His headstone bears the inscription; "He Gave His Life, A Ransom For Many." Lived at 63 Cromwell Street, Burnley. Note: CWGC erroneously state his first initial as "G"
The above photo is a copy which was sent to his sister who had emigrated to Canada in 1904. She was my grandmother. Isaac lived at Pelsall, Staffordshire and had 12 brothers and sisters. I was lucky enough to visit the town and the South Staffs Regimental Museum in 2010 where there is a copy of the war diaries from March 1918. Isaac was mentioned in the diary by name. 2nd September 1917, aged 26. Son of John and Margaret Cleghorn, of Clifton, Alyth, Perthshire. ​His headstone bears the inscription; "We Give Thanks To God Always For You Clifton, Alyth, Scotland." 1st/7th Bn. Duke of Wellington's Regiment. Born Great Yarmouth. Son of James Alfred and Alice Maud Eastick, of 20, Norfolk Place, Boston. His headstone bears the inscription; "Remembered By All At Home." 20th May 1916, aged 24. Son of Thomas Henry and Emma Gertrude Fletcher. Born Belper, Derbyshire, England. Enlisted on 19 March 1915 and died of disease at St. Omer, France, on 20 May 1916. Born in Belper, Derbyshire, England, he moved to Australia aged twenty, working as a salesman at Anthony Hordern prior to his enlistment. Henry Albert Franco, M. M.
16th February 1918, aged 34. Silver Medal (Serbia). Son of Francisco and Nora Franco, of Martin St., Birkenhead, South Australia. Born Adelaide, South Australia. His headstone bears the inscription; "Ever Remembered By His Loving Mother And Sister N. Franco, J. Jeanes." A camel driver from Birkenhead, SA prior to enlistment, Pte Franco embarked with C Company from Fremantle on HMAT Ascanius on 19 June 1915. 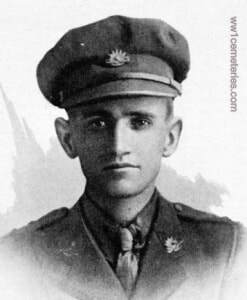 On 9 June 1916 he was awarded the Military Medal for "conspicuous work with covering parties to Engineers...at Gallipoli. Was wounded...and his chief regret was that he had to leave his company". He was also awarded the Serbian Silver Medal for "distinguished services rendered during the MEF campaign". On 16 February 1918 he died from pleurisy in the New Zealand Stationary Hospital, Wisques, France, aged 34. 15th September 1915, aged 21. Son of William and Eva L. Gammon, of 90, Divinity Rd., Oxford. 9th September 1915, aged 34. Son of Thomas and Jean Gibson, of Blantyre, Glasgow; husband of Jessie Stoddart Gibson, of 38, Broompark Rd., High Blantyre, Glasgow. His headstone bears the inscription; "Sleep On Beloved Sleep And Take Thy Rest." 6th October 1917, aged 27. Son of Alexander and Jane Gillespie, of Lake Boga, Victoria, Australia. His headstone bears the inscription; "He Being Dead Yet Speaketh." 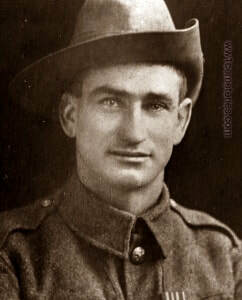 A farmer from Lake Boga, Victoria prior to enlistment, A/Cpl Gillespie embarked with the 16th Reinforcements from Melbourne on HMAT Suffolk on 1 April 1916. 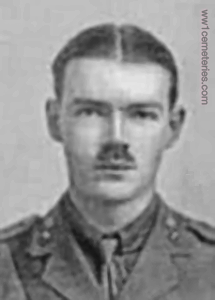 Later reverting to the rank of Private, he was wounded in action at Polygon Wood. On 6 October 1917, aged 27, he succumbed to his wounds. Noel died at 59th General Hospital from wounds described as "Gun Shot wound of the chest penetrating and Gun Shot wound of arm." 10th August 1918, aged 29. Son of Elizabeth Butterworth (formerly Harrop), of 72, Grosvenor St., Ashton-under-Lyne. His headstone bears the inscription; "His Memory Is Our Sweetest Thought." 16th December 1917, aged 23. Son of Alfred Albert and Sarah Henry, of Natte Yallock, Victoria, Australia. His headstone bears the inscription; "The Lord Gave And The Lord Hath Taken Away." The Officer Commanding No.7 General Hospital at St. Omer wrote; "This man was admitted here on 2nd December 1917 suffering from Gun Shot wound left thigh and a slight wound to the neck. He was doing well until 14.12.17., when there was more haemorrhage, he died at 7.p.m. on 16th December. ​"Henry was a Bombardier, aged about 22. He was in charge of a fatigue party of about 15 men and unloading ammunition at Anzac Ridge, Ypres. A shell fell as we were returning along the duckboard near Shrapnel Corner and Henry was hit. I and others carried him to the Dressing Station which was, I think, on the Menin Road. He was wounded in the head, back and legs by shrapnel. We said goodbye to him but could not get a reply. I did not see him again." 1st November 1918, aged 32. Son of James Lindsay, of Stewarton, Ayrshire; husband of Ellen Rafferty Lindsay, of Gateside, Beith, Ayrshire. 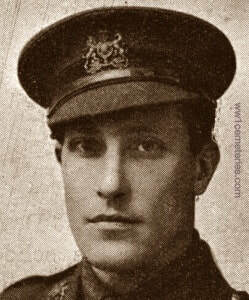 Thomas Wilkes Lonsdale, M. C.
5th June 1916, aged 22. Son of Thomas Henry Burnett Lonsdale and A. D. Lonsdale, of 51, Parkwood Rd., Bournemouth.